DARTMOUTH, NS – Charlottetown’s Upstreet Craft Brewing has announced that its spin-off brewery and restaurant in Dartmouth, Nova Scotia is now open. 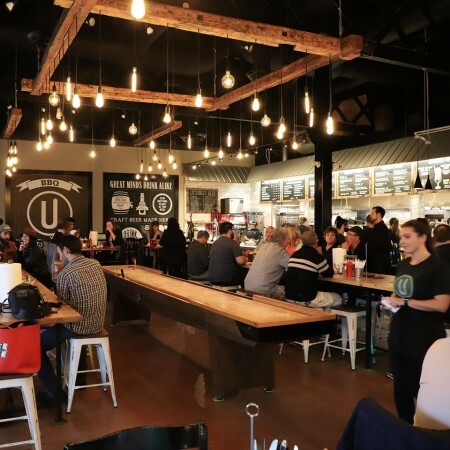 Upstreet BBQ Brewhouse opened today at 11:00 AM, and is offering versions of several core Upstreet brands brewed on-site, along with rotating one-off and seasonal beers. Also on tap is Major Tom Sour (5.0% abv), a new dry-hopped sour that is debuting simultaneously at both the Dartmouth and Charlottetown locations. The food program is being overseen by Chef Bill Pratt and his team from Chef Inspired Group of Restaurants, and features authentic Southern BBQ items including rib, brisket, pulled pork, and smoked jackfruit as a vegetarian/vegan option. In addition to the bar and restaurant, the venue also includes a retail shop selling cans, bottles, growlers and crowlers to go, as well as a selection of branded merchandise. Upstreet BBQ Brewhouse is located at 612 Windmill Road, an address that has two decades of brewing history behind it. Opened in 1998 as Maritime Beer Company, the facility was taken over by Sleeman Breweries in 2000, and closed in 2013. It was then reopened in 2016 as DownEast Beer Factory, a short-lived operation that shut down last autumn. For more details, see the Upstreet BBQ Brewhouse website and Facebook page.